I saw an interesting article on BBC News recently entitled “Machines to match man by 2029“. After reading it I realized that I needed no more proof to support my above comments. It talks about humans soon being able to implant nanobots in their brains to make them smarter among other things one thought to be impossible or…you guess it….fiction. I mean think about it and take a mental travel back in time 50 years and imagine life back then, who would have thought that in a few years anyone will have the opportunity to be cared for in old age by a robot much less being a tourist in space. Return to the future now and think why Japan even needs to draft guidelines for robot use. One last ramble, by the strictest definition of the word aren’t people with pacemakers, artificial mechanical limbs and other such modification technically cyborgs? A cyborg is a cybernetic organism or an organism that is a self-regulating integration of artificial and natural systems. While I’m quoting one definition I thought I’d just post a few more relation words and definitions. (^_^). All difinitions are taken from wikipedia. A robot is a mechanical or virtual, artificial agent. It is usually an electromechanical system, which, by its appearance or movements, conveys a sense that it has intent or agency of its own. The term “humanoid” refers to any being whose body structure resembles that of a human. In this sense, the term indeed describes primates, as well as mythological creatures and artificial organisms (robots), especially in the context of science fiction and fantasy fiction. An android is a robot designed to resemble a human, usually both in appearance and behavior. Gynoid is a term used to describe a robot designed to look like a human female, as compared to an android modeled after a male. 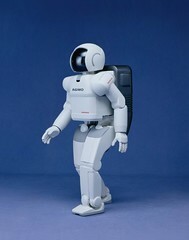 The term is not common, however, with android often being used to refer to both “sexes” of robot. Mecha, also known as meka or mechs, are walking vehicles controlled by a pilot, often appearing in science fiction or other genres involving a fantastic or futuristic element. Mecha are generally, though not necessarily, bipedal. In most fiction in which they appear, mecha are war machines: essentially armored fighting vehicles with legs instead of treads or wheels. The scientific definition of a “machine” is any device that transmits or modifies energy. In common usage, the meaning is restricted to devices having rigid moving parts that perform or assist in performing some work. Machines normally require some energy source (“input”) and always accomplish some sort of work (“output”). Yes, they are technically by all terms a cyborg. You are correct the only people who ever thought those things would eventually be possible are Science Fiction writers. Also, if you haven’t come upon this blog before. It presents news articles of developing technology that use to be science fiction along with who thought of it first. thank you for that very useful link CS…I’ll be surfing through that website. well my 2 cents….anyone who know anything about science should really know that term is an oxymoron a paradox a falsehood. I mean what is more real than science. "Science fiction is merely stuff we imagine now but science will manifest later"
I want my own android…make that gynoid. That’s all I need. I don’t think i want the nanobots in my brain; i really hope we retain humanity and use robotics in an auxilliary supporting role. Hey, we are the stars of planed Earth OK! Never knew there were such strict definitions for robots. But they won’t be around in 2029. Heck, we thought they’d be around by 2000.